I’m a third-year college student who has signed up for far too many classes this semester — and therefore, an avid iced coffee drinker. But I’ve also lost almost all my reusable cups and water bottles. I enjoy the convenience of takeout food in plastic containers. And I have difficulty confronting just how much waste I’ve thrown away without thought. I live in a city in the San Francisco Bay Area, and on my campus I see clearly labeled compost, recycling and landfill bins. It feels like the problems of my waste are being taken care of for me. Still, I do feel that twinge of discomfort every time I pick up the single use plastic cup from a coffee shop. Yet if I don’t buy this iced coffee and throw out the container, won’t someone else eventually? My choice to avoid a plastic cup does not render it nonexistent. This internal conflict got me writing about the topic of plastic waste. I grew up singing “Reduce, Reuse, Recycle,” and celebrating Earth Day in elementary school. But as an adult, I see all evidence from the past 20 years pointing to the deterioration of the planet at a highly unnatural speed. I wanted to really understand what we’ve been doing wrong, and how we can alter our frameworks to create truly effective solutions. There was so much I discovered, but these are the findings I felt most compelled to share. One of the most hopeful aspects of the plastic pollution crisis is that it is extremely difficult to deny that there’s a problem. For instance: approximately a million plastic bottles are sold in the U.S. every minute, and only 9% of all plastic in the U.S. is recycled — according to a study from UC Santa Barbara. And when vast figures are difficult to fathom, photos and videos of ocean surfaces covered in plastic waste is enough to get almost anyone to acknowledge the catastrophe. Not only is the overproduction of plastic leading to ocean pollution, other effects include toxic fume emissions, drainage system blockages, the extermination of fish and other species. Whether it is ocean or land animals, biodiversity is suffering as animals mistakenly consume garbage disposed by humans. It’s clear that this lifestyle cannot sustain our planet — and therefore the longevity of the human race. Consumer plastic production skyrocketed in the 1950s as a consequence of the war, and a shocking amount of the plastic on earth today — 44% — was made after the year 2000. Plastic pieces in the ocean are younger than most living people — yet our addiction to it has already produced lifetimes of damage. Fortunately, a burst of advocacy has become mainstream in recent years. Many efforts can be thanked for this, such as the United Nations’ “#CleanSea” campaign in 2017, or a video of a plastic straw getting extracted from a turtle’s nose that had over 50 million views. With high-profile news stories, such as Starbucks phasing out plastic straws by 2020, and increasing amounts of individuals publishing “I Lived Plastic-Free for a Month” YouTube videos, awareness and activism are on the rise. The rest of the video shows her battling constant encounters with plastic in daily life — sprinkled with interviews from environmental preservation experts, facts and statistics about plastic pollution, and video clips of oceans filled with plastic. Her solutions are strong suggestions for individuals who are trying to reduce plastic use. Some may seem more obvious: she brings a reusable cup with an aluminum straw to a coffee shop; she uses her purse to hold a paper-wrapped sandwich instead of carrying it in a plastic bag, and chooses to eat in instead of takeout to avoid plastic cutlery or containers. Other solutions were less expected. For instance, she goes to a bulk food store and puts produce directly in her grocery cart without putting them in a plastic bag. But she soon realized some plastic use is simply unavoidable. “Don’t order anything online if you’re trying to avoid plastic, because this just came in my package,” exasperated, the woman holds up the large plastic bubbles that cushioned her delivery. Over 40% of all plastic production is for packaging, almost all of which will be immediately thrown away. Even someone who is dedicating their lifestyle to avoiding plastic will literally have it delivered to their doorstep. So will a few individuals attempting the “plastic-free” challenge be enough? Taking on this challenge is an excellent expression of environmental advocacy. But that alone is inadequate against the mass production of plastic. Plastic is cheap. Plastic is convenient. Producing and distributing it is simply in the best interest of multibillion dollar corporations. The popular misconception that consumers should be held responsible for environmental preservation is almost as old as mass plastic production itself. In the 1950s, “Keep America Beautiful,” a non-profit organization, was established by former beverage and packaging industry professionals. Together, they created the 1970s advertising campaign that encouraged “everyone to do their part” to help the environment. This campaign is most well-known for creating and spreading the term “litterbug.” While the looks of America’s streets have surely benefited from this, the catch of “Keep America Beautiful” is that it receives millions of dollars in funding almost exclusively from corporations. These companies — such as Coca Cola, Pepsi, and McDonald’s — are all involved in lobbying to block legislations that limit plastic production, specifically bottle bills. “Keep America Beautiful” is ultimately a greenwashing front — meaning that it manipulates the focus of mass America in order to surreptitiously continue the mass production of plastic. Then blame is placed upon individual citizens to distract from the actual sources of the problem. Some citizens have recognized this, and in addition to taking on more “green” lifestyles, they are supporting public policies and new solutions to make change at a higher level. For instance, several foundations are pushing for a “circular economy” model, meaning that plastic should be produced with plans for how it will be recycled, or upcycled, already in mind. The “Roadmap to Sustainability” is a comprehensive but accessible paper published by UN Environment. It explains what policymakers should focus on when creating environmental preservation legislation. Solutions to an issue of this scale are not simple. The UN paper emphasizes that many details must be taken into account, particularly: the time it takes to transition from cultural plastic addiction, engaging and educating stakeholders and providing them financial incentives, creating proactive enforcement systems for bans and levies, and reinvesting the revenue from bans and levies into more environmental preservation projects. While implementing policy moves gradually, individuals can still take action in their daily lives. 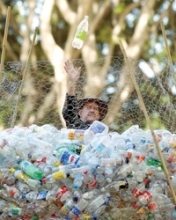 Reusing plastic as much as possible and avoiding it altogether are great ways to step up one’s environmental advocacy. But voting for politicians who emphasize green initiatives, and supporting organizations that are creating circular economy solutions (such as the Ellen MacArthur Foundation) are too often overlooked. Going into this project, I may have underestimated how complex this problem really is. It’s tempting to oversimplify crises and place blame on one party. In reality, there are countless influences — individuals, organizations, businesses both small and large — that are both contributing to and are affected by this environmental predicament. I myself may not have the ability to propose high-level solutions. But the process of research has empowered me with awareness, and it’s given me guidance for how I as an individual can be part of a truly productive force of change.